What 3” treasure do you think this woman is showing us? Is it a strange/rare piece of jewelry in that box? Why IS that little black thing so precious that she must have plastic gloves on in order to show it to us? 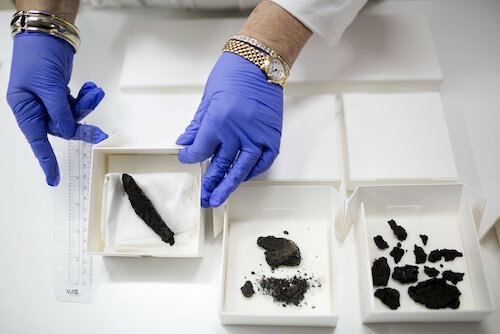 That little black cylinder is a fragment from a charred Hebrew Bible scroll found by Israeli archeologists in 1970 inside the burned ruins of a 2,000 year-old synagogue in Ein (aka En) Gedi on the western shore of the Dead Sea. They knew it was a Biblical scroll of some sort because it was found inside the Holy Ark of the synagogue where the Torah was placed. 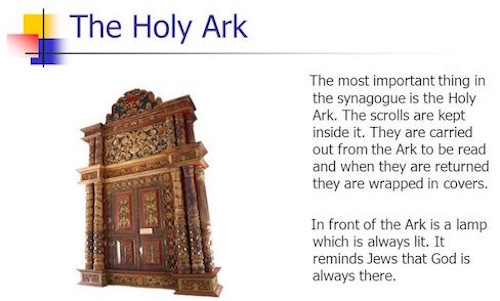 This was the first time in the history of archeological excavation that a Torah scroll had been found inside the Ark. For almost 50 years the burned cylinder has remained untouched because it is so fragile it could disintegrate. WHAT WRITING was INSIDE that charred scroll, they wondered. Probably no one will ever know, they speculated, because we cannot unroll it. 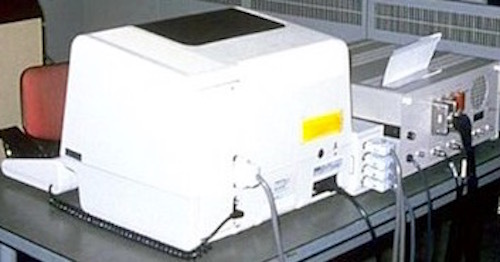 Until…the mid-1980’s when early prototypes of 3D Scanning machines came on the scene. A modern 3D scanner analyzes objects to collect data which can be used to construct digital three-dimensional models. The scanner had been used on unintelligible fragments of the Dead Sea Scrolls with some success. 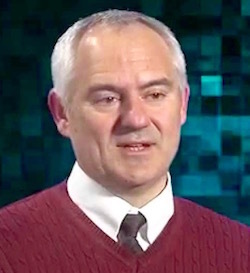 Dr. W. Brent Seales, Chair of Computer Science at the University of Kentucky, had developed digital imaging software to read the Dead Sea Scrolls, so the charred Ein-Gedi Scroll was sent to him. The rest is history, as they say. Seales took the scan of the burned lump that had been scanned by a commercially available X-ray based, micro-computed tomography machine and sent to him by Dr. Shor, curator and director of the IAA’s Dead Sea Scrolls Project. Seales used his “volume cartography” technique and the results were amazing. 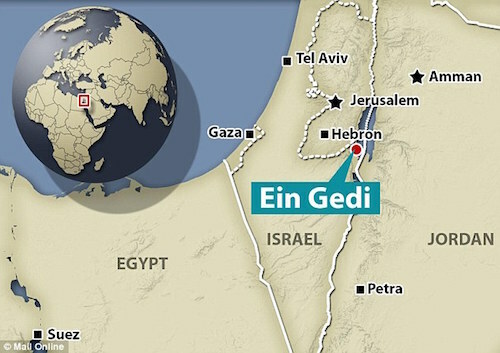 “Much of the text is now as readable as that of unharmed Dead Sea Scrolls….the Ein Gedi Leviticus Scroll is the most extensive and significant Biblical text from antiquity that has come to light” said Michael Seagal of Hebrew University in Jerusalem who helped analyze the text. The Ein Gedi scroll further illumines the assiduous way Hebrew scribes accurately (with the help of God) copied ancient Biblical texts. 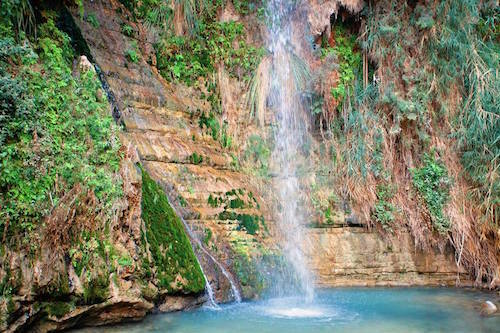 The 2,000-year-old Ein Gedi text is identical to the official Masoretic Text developed c. 1,000 years later and still used for Old Testament translations by Protestants, Catholics and Jews. This is how the composite image of the carbonized scroll (which could not be manually opened) looks when it is VIRTUALLY OPENED/UNWRAPPED. Notice the actual never-to-be-manually-opened black scroll on the extreme right of the “unwrapped virtual” picture. This writer cannot help but comment on the many mentions of “fire” in the Biblical text that was inside this fire-burned cylinder: “the burnt offering,” “fire on the altar,” “in the wood that is on the fire on the altar.” Maybe I should have named this article “The Burnt Offering?” For it is a burnt offering of sort to the hand of God upon Bible texts over the millennia. This c. 2,000 year-old text from Leviticus corresponds almost word for word to the very many English translations of the Old Testament over the last 500 years or more. 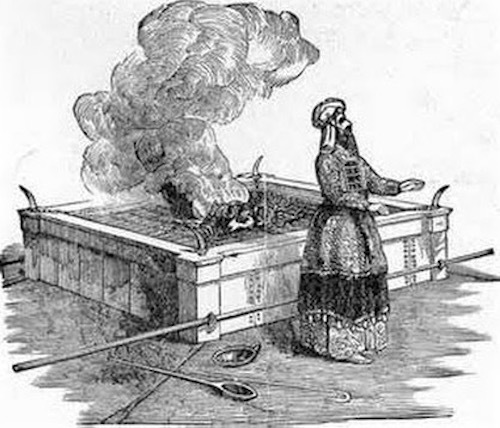 This writer has done several articles on ancient technology and ingenuity that astound, astonish and baffle our modern world. Click below for two of these. As stunning and staggering as ancient technology was, it could NEVER have opened a tiny burned-to-a-crisp fragment found in the Ark of a burned-down synagogue. 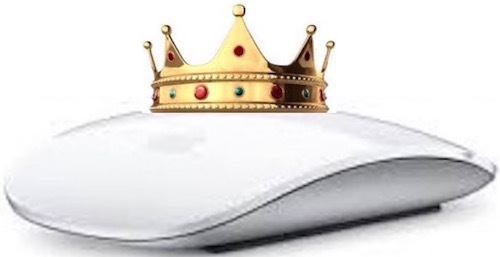 For us in the beginning of the 21st century computer technology and software are king. Who knows what other offerings await us, however?